As I write this, it has been one year since my swearing-in on the South-Western City Schools Board of Education, and it has truly been a wonderful experience. The number of events I’ve been able to attend, witnessing students and teachers at their very best during the holiday season, is the greatest gift of all. The hallmark of the fall was the Issue 7 campaign. 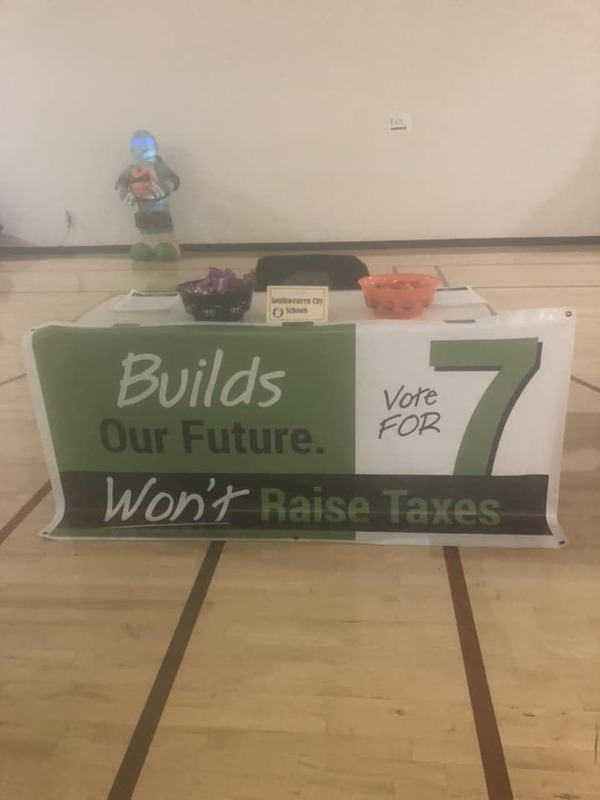 Issue 7 is a no-new-millage bond issue which (now passed by our voters) will replace Brookpark, Finland, Norton and Pleasant View Middle Schools, add an addition to Jackson Middle School, renovate East Franklin Elementary School, and complete other maintenance and infrastructure projects across our District. In the campaign for Issue 7, I was co-chair of our phone banks with fellow Board Member Cathy Johnson. On a weekly basis for 5 weeks, each of us simultaneously held two phone banks in different parts of the District, staffed by teachers, PTA parents and community members. These events contacted thousands of voters each week, leaving voicemails and having meaningful conversations with our residents. Below are some pictures from this busy campaign season! I also was honored to attend a number of events around the District. 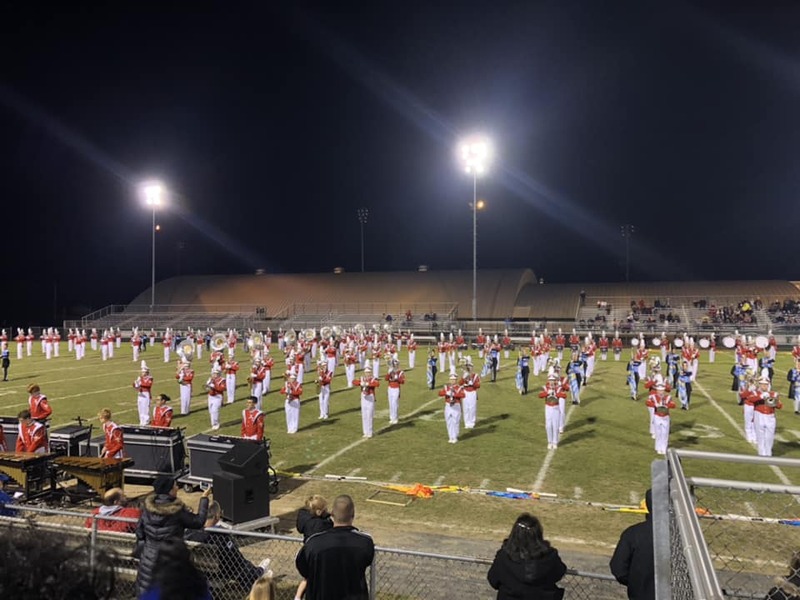 From Football Friday Nights to holiday concert benefits, fall and winter are always one of the most exciting times of the year! Finally, our actual meetings are always a joy. I learn so much from fellow Board Members, both within our District, and those in other Districts. One of the biggest things you learn in service to any Board is how much you don’t know going into it. This isn’t just in terms of factual knowledge of the District, but also in terms of the conventions of the District. There are many ways of doing things, or rules that are unspoken, that you just have to learn as you go - as you would with any new job. One year in, I do feel like I have a better grasp of some of these conventions than I did going in. In terms of accomplishments of the Board, beyond the success of Issue 7, we have also witnessed increased presences of Communities in Schools and I Know I Can, which are going beyond the traditional walls of the classroom to enhance the experience of the whole child, whether assisting families with their needs, getting students information they need for post-secondary education, and more. The achievements of our Career Academy continue to be nothing short of remarkable. Every time I visit this building, I am simply amazed by the number of programs available to students - over 15 distinct career pathways, which often include certifications and real-world experience, are available. We also have seen increases across the board in student achievement, including a marked increase in our third grade reading levels, which is no doubt evidence of all-day, every-day kindergarten implementation. This is merely scratching the surface. I want to congratulate some of my colleagues as well. Mindy Garverick (below with me at a Board meeting, using virtual reality viewers that our students have access to) has been named 2019 Board President, and Robert Ragland, Sr., is Vice President. Photo Credit Sandy Nekoloff, Director of Communications, SWCSD. In the second picture below is me talking with Lee Schreiner, outgoing Board President, who is also the incoming President of the Ohio School Boards Association. Finally, I have continued reaching out to you, to hear your concerns. I try to attend 1-2 PTA meetings per month, and every Thursday have continued #TakePartThursdays, where I select a street at random to discuss your thoughts and concerns about the District. 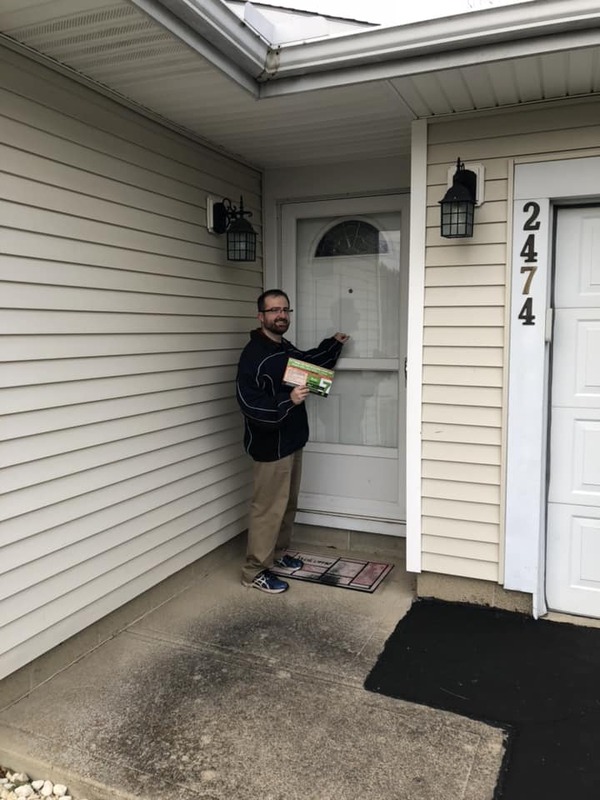 These were particularly helpful during the Issue 7 campaign, because I could answer people’s questions about the bond issue at their doorstep. Community engagement is absolutely critical to me, and I look forward to continuing these practices in 2019 and beyond. Thank you so very much for the privilege of serving you. Our staff, students and parents are the most wonderful, diverse community you could imagine, and I can’t wait to see what’s in store this year! If you have any questions or concerns, or even want me to help volunteer at an event at your school, do not hesitate to email me at david.donofrio@swcsd.us, or call 614-327-6310. You can also reach me on social media - just find my name. Thank you! After graduation, the work of the Board continues! During this time is when we pass many of our operating budget items for the fiscal year. Our late June meeting is actually held in the morning instead of our normal evening time, to allow the Administration to submit everything they need during the work day for the budget. In our July 9 meeting, I was very happy that we unanimously voted to place a "no new millage" bond issue on the November ballot! This, 1.86-mill bond issue, essentially gives the district the legal authority to maintain its current collection rate - but for a new project. This can be done as the result of the retirement of expiring bond debt. You'll remember in 2012 a bond issue provided new elementary buildings and a new Franklin Heights High School. This issue, dubbed "Segment 2" of an anticipated 3 segment program, will construct 4 new middle school buildings - brand-new Brookpark, Finland, Norton and Pleasant View Middle Schools - as well as renovations of East Franklin Elementary and Jackson Middle School. The issue also will include some funds for infrastructure improvements such as paving. It's important that we continue moving our District forward by supporting this issue, and I hope to work very hard on the issue's behalf with the Citizens for SWCS group to ensure its passage this fall. It is also my birthday week, and I was excited to do a couple of things for our District. Last night we held my first-ever "Backpack Birthday BBQ," where people brought new school supplies for the upcoming year! I consulted with the Council of PTA's as well as the District Administration to ensure that we highlighted the most-needed items for students in our area. The items will be dropped off to the District Service Center for distribution to schools with the most need. I'm already hearing from residents ways that we can expand this program in the future, so stay tuned! Some of the donated items from the first-ever Backpack Birthday BBQ! Hi everyone! I know it has been a busy few months, including my marriage and graduations in May and early June, so I apologize for being slow to update you. Here are some key items from the past quarter. Our District is planning to initiate a bond issue for the Fall 2018 Ballot to secure funding for the construction of 4 middle schools, renovation of Jackson Middle, and renovation of East Franklin Elementary. 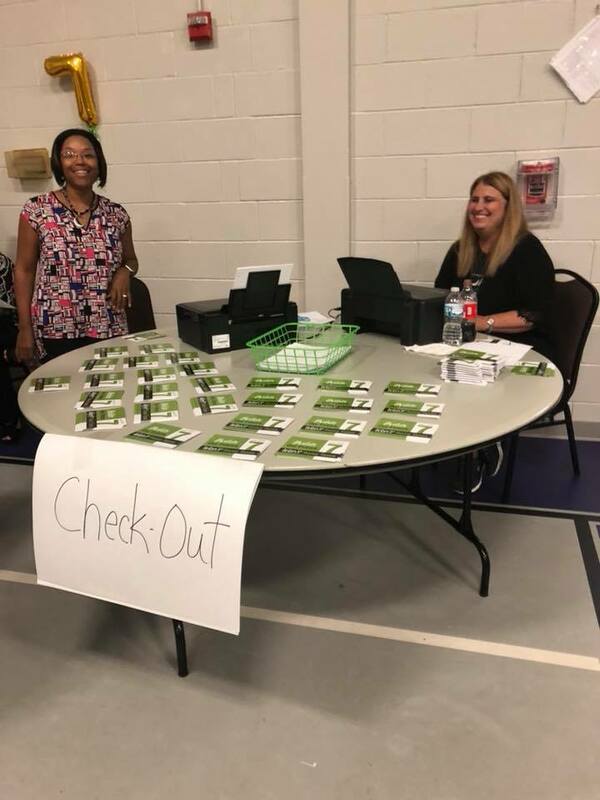 We hosted several community input sessions at the different middle schools to discuss the renovations, as well as redistricting from the reopening of EFES and the planned expansion of Bolton Crossing ES. I was glad to attend some of these to hear community opinions, as well as during the continuation of Take Part Thursdays. Agenda from Community Input Meetings about School Construction/Renovation Projects. In Students, Schools and Community, we have largely approved a number of field trips. One student organization is even going to Iceland next spring to learn about the unique geothermal environment there. I'm always excited to be a part of approving special opportunities for our students to see the world around them, as there are often no greater learning opportunities than those gained firsthand. I'm very proud that our school board, at my suggestion, made an update to our District's policy language on non-discrimination to include gender identity. I also attended, in an early celebration of Pride Month, Gay-Straight Alliance meetings at Franklin Heights and Central Crossing High Schools. It was a fantastic experience to share my own story, and hear the stories of students who are proud to be who they are. All of this lead up to late May and early June, with the graduations of all four high schools at the Ohio Expo Center, as well as special graduations of the South-Western Career Academy, Project SEARCH, and a number of award ceremonies celebrating student achievement. Just a few photos from these wonderful events are shown below. It gave me such pride to hear what our students plan to do next, from entering the military, to the workforce, to college. The over 1,200 graduates we now send into the world are some of the most prepared in Ohio - of that I have no doubt! -I attended 2 conferences by the Ohio School Boards Association, including New Board Members 101 and School Finance 101. These were great opportunities for me to interact with other school board members and administrators from across the state. Although it was a ton of information, I found them to be extremely valuable. There are a lot of resources available if you just know where to look! -My role on the agenda in school board meetings this year is to share the Community/Students/Schools items. These agenda items include partnerships our district has in the community, as well as opportunities for students to participate in programs outside the school, including field trips, athletic conferences, and more. Each of these items receives formal board approval. -I have been keeping up with Take Part Thursdays every week - I am glad to keep connected to our residents this way, and hear your concerns. -I've started to attend PTSA (Parent-Teacher-Student Association) meetings on a nearly weekly basis. At those meetings, I am more or less just there to listen, and let parents know at each school that I am there as a resource. -In mid-February, there was a vote to renew "pay to participate" fees for the 2018-19 school year. I was afforded an opportunity to state my opposition to this policy, but the fees were renewed without any increases. Although I was in the minority on this position, I am one of 5 board members, and we operate as any board would - following majority rules. We have the opportunity to state our opinions on any issue, whether we agree or not, but we stand by the Board's decisions when votes occur. I understand that these fees generate almost half a million dollars in revenue that the District needs to operate, and until we can find a suitable replacement for those monies, it will be very hard to make that much of a cut to our budget. I understand why the Board made the decision it did. I'm very much looking to our board retreat this Saturday, where we'll hear from a lot of other departments and discuss more issues for the coming year! Thank you for all of your support so far. On January 8th, in front of family, friends and neighbors, I was sworn into office by the President of the Franklin County Commissioners, my dear friend Kevin Boyce. Commissioner Boyce and I met some 15 years ago, when he was on the Columbus City Council, and I was a teenager in high school joining a new organization he founded, the Columbus Youth Commission. This group was created to advise the Mayor and City Council on youth issues, and I was proud to be one of the founding members for its first 3 years, until I went to college. In this first meeting, we had an annual approval of the District's budget, followed by the election of Lee Schreiner as President, and Mindy Garverick as Vice President (which I was excited to make as my first official motion). In the formal meeting, of note was the approval of a construction manager for a new pre-K through 4th grade building adjacent to Bolton Crossing Elementary. The funds for this addition are covered by savings during construction of the buildings in the last bond issue voters approved. I'm very excited to begin serving you. Please reach out to me at any time with your questions or concerns, and I'll do my best to assist you. Thanks for stopping by my website. I am absolutely honored to begin serving you as your member of the South-Western City Schools Board of Education on January 1, 2018! Our first school board meeting of 2018, including the swearing-in of new members and organization of the leadership, will occur on Monday, January 8 at 6:30pm. The School District's Service Center (DSC) is located at 3805 Marlane Dr., Grove City, OH 43123. Meetings are open to the public - the full schedule is visible by clicking here. One other item I'd like you to be aware of as I begin is "Take Part Thursdays." Click on this link to learn more about this initiative I created, and let me know your thoughts at any time. I am so excited for this journey! Connect with me here or using the social media buttons below, and let's build a future that is #SouthWesternStrong. Thanks! Paid for by David Donofrio for Ohio, Ryan Ladina, Treasurer. Not at Taxpayer Expense.